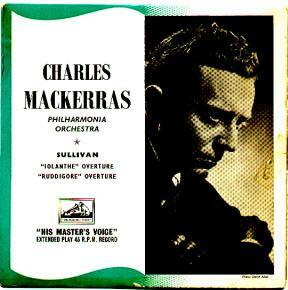 In 1957, Charles Mackerras recorded the overtures to Mikado, Yeomen, Iolanthe and Ruddigore (Toye version) for EMI. These four seem an odd choice — choosing the non-Sullivan Ruddigore over numerous others that Sullivan did write — but these seem to be the only ones Mackerras recorded at this time. At present, the only contemporary releases that have come to my notice are a reel-to-reel tape containing all four overtures, and a 45rpm record containing the overtures to Iolanthe and Ruddigore; presumably, there is another 45rpm record out there with the other two. Sleeve notes, in both cases, are by Arthur Jacobs. Neither reel-to-reel nor 45rpm were ever predominant formats, so this material was probably issued on LP, as well, but the details of that issue have not come to my attention. Chris Webster points out that an LP with just four overtures is awfully skimpy, but then, Decca published a 10" LP with only two overtures on it (here), so this is certainly possible, but correspondent Stephen Crane assures me that these were never published on LP. Chris also points out that "the photo on the EP sleeve is a head and shoulders shot of Mackerras, which I think makes it clear that it was being pushed as a Mackerras recording rather than being 'G&S Overtures with orchestra conducted by so-and-so'." The Mikado and Ruddigore overtures were re-issued on the 1970s disc, Music of Eric Coates, etc.. All four were included on the 1997 compilation "Pineapple Poll / Savoy Opera Overtures," part of EMI's British Composers series. 197-? EMI LP CFP 40279 Overtures to The Mikado and Ruddigore included in the compilation Music of Eric Coates, etc.